Galls on plants are funny things. They come in all sizes, funky shapes, and crazy colors. There are thousands of different types of galls and they can be caused by insects, fungi, bacteria, mites, midges, or wasps. Galls can form on the leaves, buds, flowers, stems, twigs, branches, and even on roots. Normally, galls are formed by the plant in response to some type of “alien invasion”; often from insect or mite feeding or egg laying. 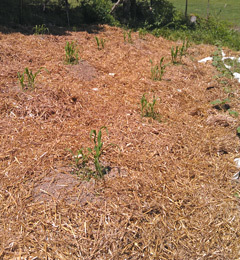 As bizarre as these abnormal growths appear, they do not usually interfere with the normal function of the plant. A few years ago I wrote about two types of galls that are common on goldenrods; the bunch gall caused by the larva of a small gnat and the stem gall caused by the larva of the goldenrod gall fly. The goldenrod was still blooming and seemed otherwise unaffected despite the presence of these galls. Oak trees seem to harbor several different types of galls, many of which are caused by tiny gall wasps. This spring when I was walking around in our yard, I noticed a bunch of hard, round galls on some low branches of a young white oak tree. These galls are called oak bullet galls (or oak marble galls) and are caused by a gall wasp. The gall forms as a deformity of a leaf bud when the wasp lays an egg within the leaf bud tissue. 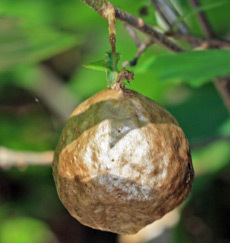 The developing larva stimulates the growth of the gall which starts out as a round green mass and matures to a hard brown marble-sized gall later in the summer. 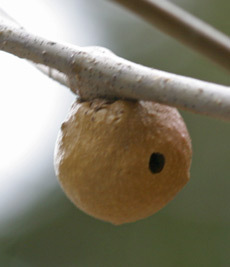 The tiny adult wasp emerges in September through a small exit hole in the gall. 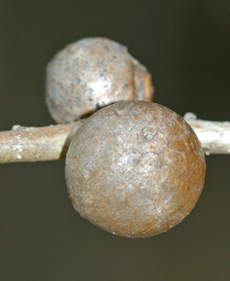 Oak bullet galls are often confused with another common oak gall called the oak apple gall. Oak apple galls are quite a bit larger than the oak bullet galls. 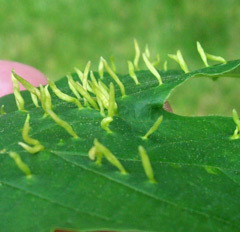 They too are caused by the feeding of a gall wasp larva. 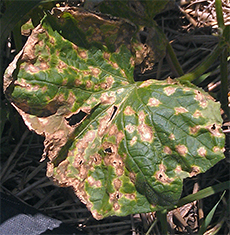 In this case, the gall actually develops from leaf tissue. Like most galls, oak bullet galls and oak apple galls do not usually hurt the tree. Wool sower galls are quite striking! 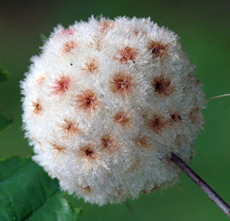 The wool sower gall is another strange gall that is only found on oak trees and specifically only found on white oaks. These puffy, round galls are caused by the larvae of another small wasp. They are really cool looking! Wool sower galls are sometimes called the oak seed gall because if you tease them apart, you will find tiny structures that resemble seeds in the center. The wasp larvae develop in these little compartments. Another really funky looking gall is the spindle gall. Every year I see these weird growths on the leaves of some of the wild cherry trees in our woods. Talk about something out of a sci-fi movie! These colorful, finger-like galls are caused by microscopic mites called eriophyid mites. The galls form in early spring when the leaves begin to expand and the tiny mites begin feeding on the leaf tissue. The upper surfaces of the leaves become covered with these crazy looking pink, red, or green spindle-shaped projections. It looks like some terrible rash! Believe it or not, the growth of these spindle galls has little effect on the health of the trees. Spindle galls are common on maples as well as cherries. 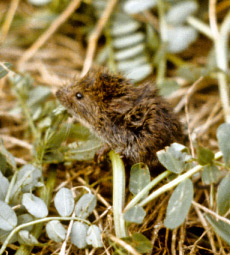 Adelgids are devastating pests of many conifer species. 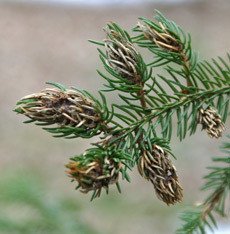 Woolly adelgids have decimated huge populations of Eastern hemlocks and Fraser fir in the eastern part of the United States. Several adelgid species, including the eastern spruce gall adelgid and the Cooley spruce gall adelgid, produce galls in various species of spruce. 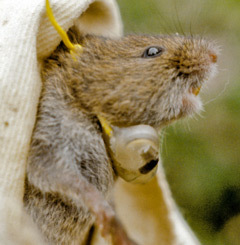 Unlike the woolly adelgids, these adelgids generally do not kill the trees unless there are repeated infestations which can eventually weaken the trees. 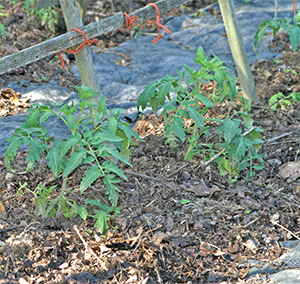 Normally the damage is limited to the tips of a few branches, but in the landscape, these brown tips can be unsightly. 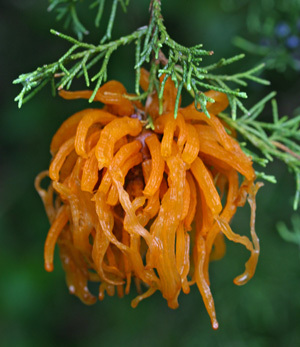 Cedar-apple rust is a fungal disease that produces weird galls on eastern red cedar trees. I’ve written about this double-host disease before. 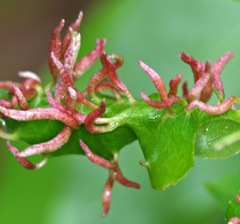 During wet weather in the spring, these galls sprout gelatinous tendrils full of fungal spores which are carried to the alternate host, apple or crabapple trees. 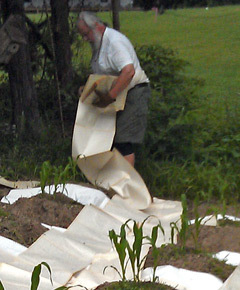 Here they cause damaging rust disease on the leaves and fruit. The galls on the cedars cause little damage to those trees but the apple and crabapple trees can be heavily damaged if they are not protected with fungicides. 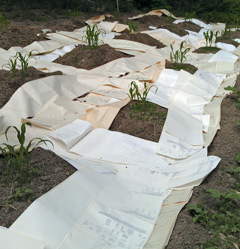 Well – that’s a little bit about some of the funky growths that you may encounter in your landscape! Normally, chemical control is not warranted or even very successful with these galls, EXCEPT in the case of the adelgids and the cedar-apple rust. Adelgids can be controlled with Bonide All Seasons Oil and the cedar-apple rust can be controlled on apples and crabapples with Bonide Copper Fungicide.